These two days work were a lucky chance for me & a strange coincidence for Simon. Back in 2011 I paddled right around the beautiful Welsh coastine, It was just a crazy dream but i was crazy enough to take it on. This trip it turned out had inspired Simon to do the same & to raise money for a local cancer hospital at the same time. Simon wanted to get some training in in preporation for the expedition so booked in with Mayberry kayaking. The first booking was skills based I beleive & that was with Mike & the second booking was for some expedition type training with skills pracice too & an overnight camp thrown in. It was supposed to be with Mike but he was running a Skomer trip so Simon ended up with me, the person who inspired his trip, a happy coincidence for both of us as I love camping trips, especially when I get paid for them! The weather was looking dubious for the trip but as it was expedition training dubious weather seemed a likely part of the training so we cracked on. The first day was wet & windy but not very big on the sea & we had a good wind mostly on our backs all day. 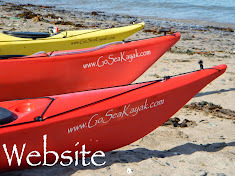 We set off from Whitesands Bay & paddled to Abermawr for our nights camp. Day two was a little more interesting as we were doing a Pembrokeshire classic (Strumble Head) on a day with a decent wind blowing & some swell running too. We were off reasonably early after breaking through some surf, it wasnt big but Simon managed to find a good set on the way out & got a faceful. The races approaching Strumble were a little lively which is what I was hoping for as this was part of the skills Simon would need on his journey around Wales. A little observation from me concluded that a good low brace was required so i devised some exercises to practice this once we were past Strumble Head, the southerly wind taking the bite out of its notorious tide races much to Simons releif. Once in the sheltered water beyond Strumble I had Simon doing lots of edging to initiate a capsize & provide a dynamic low brace opportunity, it was working a treat & Simon was doing great! We decided to finish the trip in Lower Town Fishguard & finished with more edging/bracing practice, some rolls & a clamber on deck rescue all of which Simon did really well. I think he’s ready! Camp for the night at Abermawr. Clamber on deck rescue practice.